After a very welcome few days with no agenda other than eating, remembering to occasionally change position so I don’t get DVT, more eating, drinking and throwing my sleep routine into complete chaos, I decided it was time to actually do something. Something not too challenging that could be done whilst watching endless seasonal movies and Top Gear. Queue the need to repaint something. After updating our bedside tables, I had plenty of Rust-Oleum paint left over. 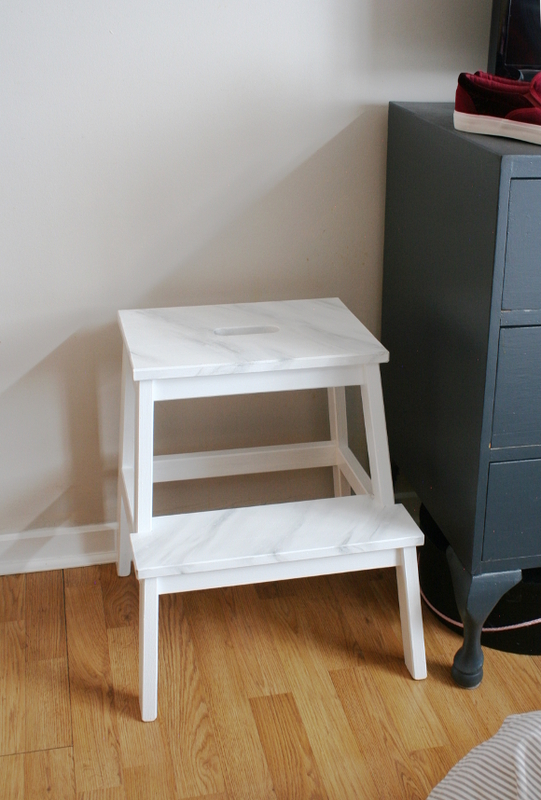 Our IKEA bekvam step stool was looking mighty haggard after I used it while sanding and repainting all the doors and skirting boards in our hallway last spring, so I had the idea to give it the same treatment as our bedside tables. Marble-ise it. It’ll be marbleous! [sorry / not sorry]. I took it through the same steps as our bedside tables with the exception of using more coats of white paint to cover the dark grey. 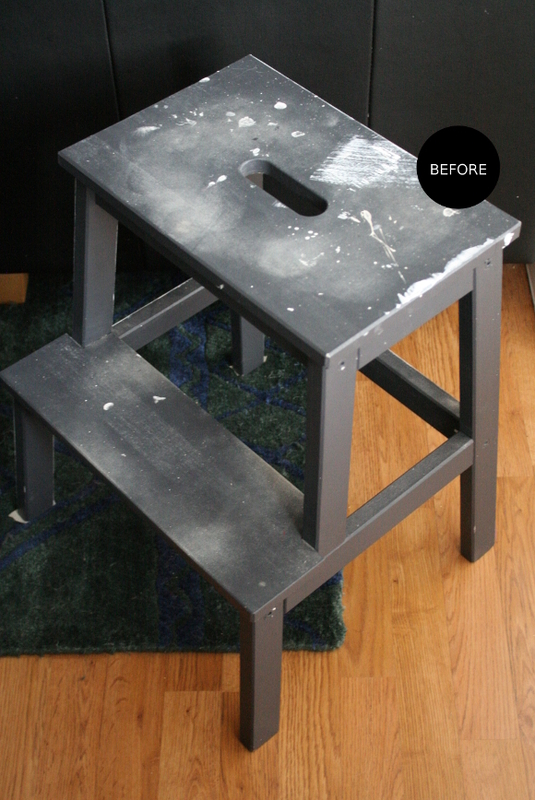 Ideally I would have disassembled the stool, except that long ago I painted over the hardware the first time I painted it [now 3 colours ago]. I know, bad DIYer. But that was in my hasty youth and I have since learned. 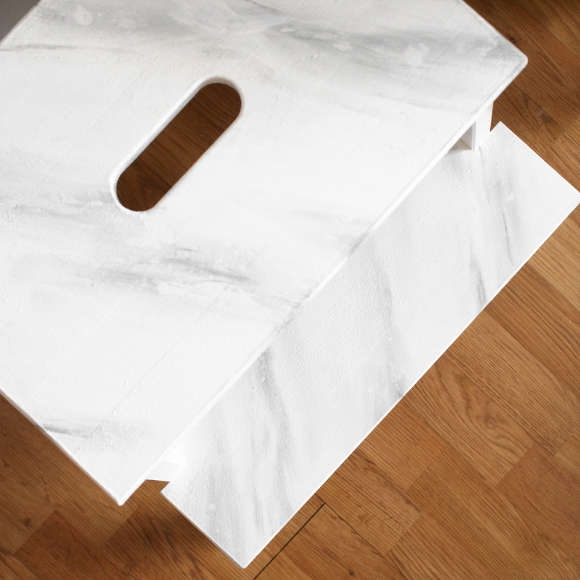 Once I had enough layers of white paint all over, I used a really subtle marble effect on both steps. 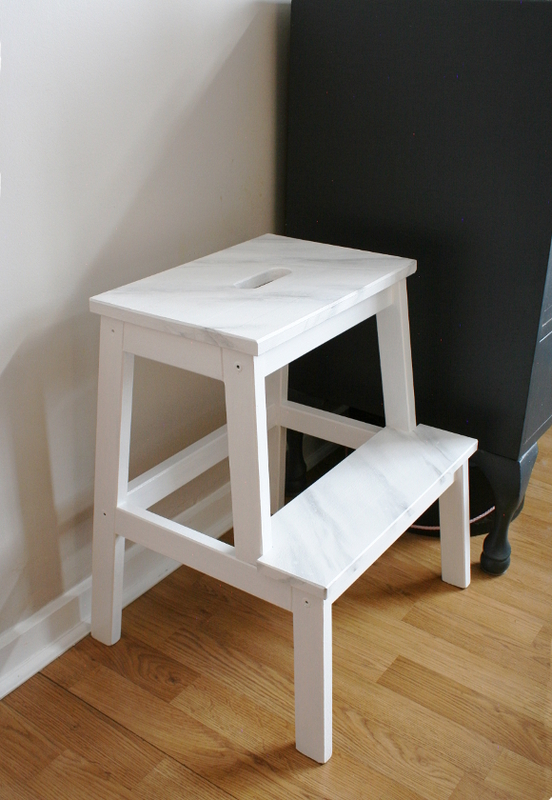 It shows up incredibly subtle, so I may paint the rest of the stool black to really make the steps pop, but I’ve yet to decide on that. For now, it’s miles better than before. And if the steps get scuffled, I think it’ll only just add to the marble effect. Disclosure – while this blog post is not sponsored, the paint I used for this update was leftover from paint I received free of charge from Rust-Oleum. Just FYI-ing you so you’re in the loop. I only work with companies I like and of course, think you will too. Thank you for supporting the companies that support The Interior DIYer. Love this. I have one of these that was never painted, just covered in paint splashes from every job I've ever done (it's not arty, it's just gross) so I REALLY need to paint it! Ugh ours was getting pretty gross. Seeing as I'm finished the worst of the DIY jobs around here (I think … ) I figured it was a good time to paint it! And if I muck it up, I can just paint it again. Merry Crimbo and Happy New Year my Hydrangea Girl! Hahahaha, I knew you'd like that Maria! Aw, and thank you <3 Merry Christmas my Dinki Dots, and happy new year! That stool is getting a lot of play! I love that you keep reinventing items. Have a wonderful new year's eve!